Does my PS3 play PS2 games? The short answer is that you can only play PS2 games on specific OLDER models of PS3. The new consoles on the market right now, particularly the 'slim' models, cannot play PS2 games. This is one of the biggest reasons that SEMPERTHREE put the addition of premium SKU PS3s on our Wishlist. 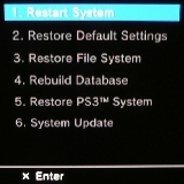 Although many PS3 owners have suggested that Sony could make a firmware update to install backwards compatibility to all systems, Sony does not seem to have this feature in it's future plans. Also, software emulation does not always yield the best results, as was the case for the second generation of backwards compatible PS3s. For more information about this please click here. We have assembled some guides for you to help with, identifying backwards compatible PS3s and for playing and getting the most out of your PS2 games when you play them on your PS3. You can also check out our detailed answer to what happened to lead Sony to remove backwards compatibility from the PS3. Playing and Getting The Most From PS2 Games On Your PS3 - Coming Soon!